Infrared security cameras are a great addition to any home or business security camera system. These cameras can allow you to see even in complete darkness by shining out an invisible infrared light that you cannot see, but the camera can see clear as day. These cameras come with various infrared ranges and distances of illumination. 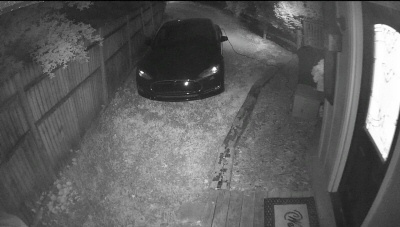 However, if improperly installed, or if they just get dirty over time, that IR light can actually end up washing out the picture provided at night especially with dome style cameras. 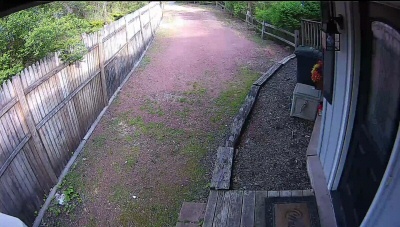 These cameras will look perfectly clear during the daytime, like the image to the left. But at night, the view will change drastically as the infrared light shines off of the dirt and debris in the way of the lens. 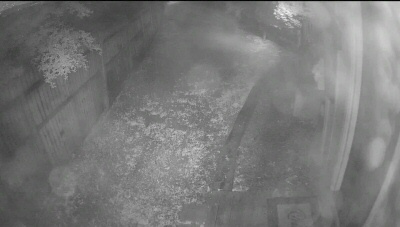 This image is taken from the same outdoor Dome HD IP Camera, the dome has gotten dirty over time with waterspots and dirt. This can also happen during installation though, if someone puts their fingers on the inside or outside of the dome of the camera. Small water spots, dirt, dust or fingerprints on the dome can cause the IR light that is emitted from the camera to reflect off of the dome surface at night, causing the image to appear bright white, washing out the picture. This camera will appear great during the daytime, these ugly white spots will only appear at night when the IR lights inside the dome come on. After properly cleaning the dome with a microfiber cloth and some NOVUS #1 cleaner, the dome once again is clear and it stops reflecting the IR light back when the IRs come on at night. This allows the camera to see as it should in complete darkness. Maintenance of the domes may be needed from time to time to help ensure that you always have the best night vision possible. When domes are easily reached, it is a good idea to clean them periodically yourself. However, as the domes are a polycarbonate surface, it is important that you do not use ammonia based cleaners or abrasive cloths (yes, not even paper towels). The proper cleaning method is to use a very soft, non-scratching microfiber cloth, and a trusted cleaner like our NOVUS brand lens cleaning solution. This will help to remove any built-up sediment, water spots or dust and dirt without scratching the lenses. This is very important, because of the fact that scratches in the dome will cause the same reflection at night.